Vote for Poppy to win the People’s Book Prize! Friends, fans and followers of Poppy Denby I need your help. I’m delighted to report that book 4 in the series, The Cairo Brief, has been nominated for the People’s Book Prize for fiction. It is one of 20 books on the shortlist. The list now goes out to public vote. If you enjoyed the book – or haven’t read it yet but have read and enjoyed the other Poppy books – please vote for it. And ask your friends and family who you have passed it onto to do the same! Thank you You can vote here. 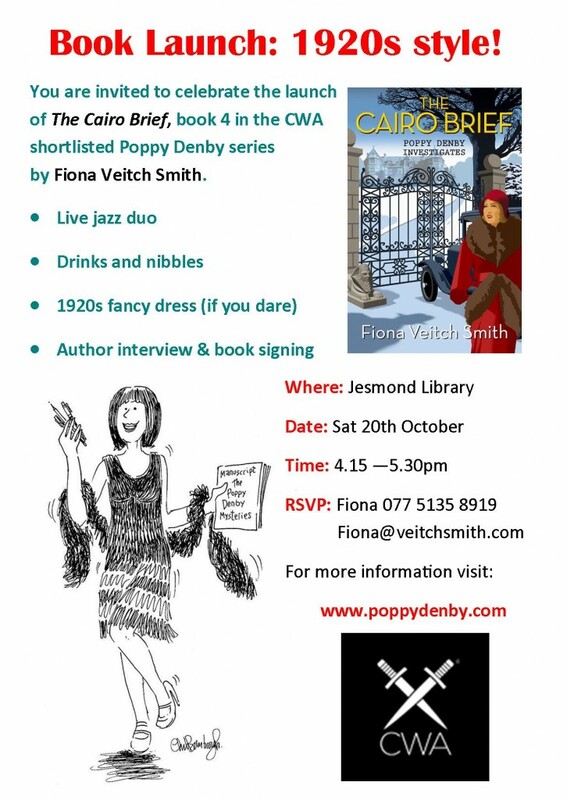 All and sundry, sundry and all (at least those who live within commuting distance of Newcastle upon Tyne) are invited to celebrate the launch of the fourth Poppy Denby book, The Cairo Brief, on Saturday 20th October, 4.15pm, Jesmond Library. I do hope to see some of you there! The Cairo Brief released today! Happy publication day to Poppy on her latest adventure, The Cairo Brief. As of today it is available at all good bookshops in the UK and through online stores. It will be released in the USA in the new year. This is book 4 in the series and it already has some fabulous reviews! Dolores Gordon-Smith, author of the Jack Haldean murder mysteries. “Fiona Veitch Smith, where have you been all my life? Poppy Denby is delightful, the plot rocks, and the 1920s era is perfectly evoked. British mystery fans, you want to read this. You really, really do.” Cassandra Chan, author of the Bethancourt & Gibbons mysteries. A.J. Wright, author of the Lancashire Detective series. Get your hands on a copy here! Cairo Brief is pick of the week! © 2019 Fiona Veitch Smith.